Curry-Flavored Baked Avocado - spice up baked avocado with curry powder. These avocados are so good, healthy and takes only 20 minutes to make! June is California Avocado Month and I am so excited to be working with the California Avocado Commission on this Curry-Flavored Baked Avocado Wedges recipe. June is the peak season for California avocados and there is no better time to enjoy the fruit. When you have perfect avocados, you don’t need a complicated recipe. This Asian-inspired recipe calls for only five ingredients. The curry powder adds a new dimension and taste structure to the avocado, and turn the fruit into a crowd-pleaser appetizer that you can serve the entire summer. As avocado is creamy and soft in texture, I used Japanese panko (bread crumbs) and sweet coconut flakes to coat the flesh. After baking, they become extremely crispy. Every bite is crunchy, creamy, with the aromatic nuance from the curry powder. 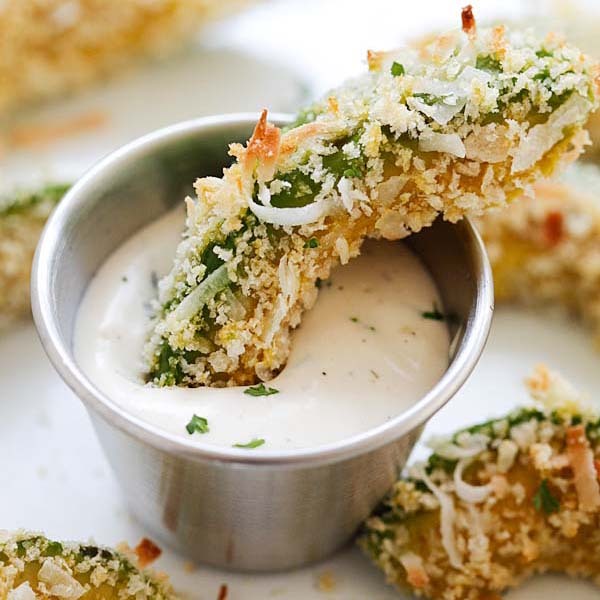 Serve the avocado wedges with your favorite ranch dipping sauce and you have the perfect finger food. The sweetest thing of all is the simplicity of this recipe as it takes about 20 minutes to make them. If you come across California Avocado in your farmers market or grocery stores, remember to pick them up and try my recipe. Disclaimer: this post is sponsored by California Avocado Commission. The opinions and texts are all mine. Cut the avocado in half and remove the seed. Slice each halves into 5 wedges and peel off the skin. Crack the eggs in a bowl and beat the eggs. In another bowl, combine the Japanese panko, coconut flakes and curry powder together. Stir to combine well. Line a baking sheet with parchment paper. 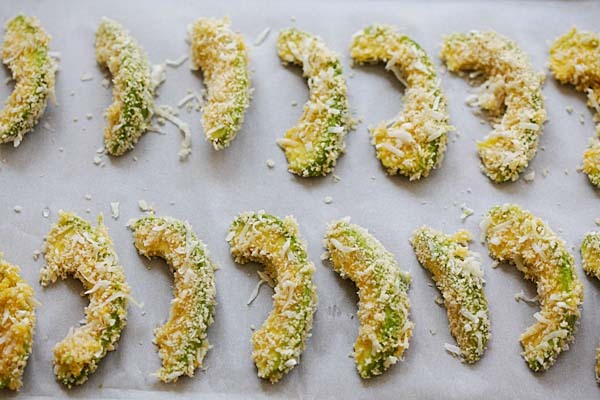 Using one hand, dip each avocado wedge into the eggs and then into the panko mixture. Coat well and transfer to the baking sheet. Repeat the same for the rest of the avocado wedges. Bake in the oven for 10 minutes or until they turn golden brown. Serve immediately with the Ranch dipping sauce. All photos and recipes on Rasa Malaysia are copyright protected. Please do not use the photos and recipes without prior written permission. If you wish to republish this recipe, please rewrite the recipe in your own words instead of copy and paste and link back to //rasamalaysia.com/curry-flavored-baked-avocado/. Thank you very much! In your ingredients, you listed 1/2 tsp curry powder and also 1 tsp curry powder. Is it 1 1/2 tsps total? Hi Crystal, recipe typo, it’s updated. 1/2 teaspoon or 1 teaspoon curry powder in avocado wedges? You have both in your recipe. Hi Ken, it was corrected. Typo. Just need 1 teaspoon curry powder. I think there is a typo in this recipe. Curry powder is listed in the ingredients 2x but isn’t in the method 2x. How much coconut? 1/2 of what? Sorry, it was half cup!